Make tightening or loosening screws or bolts easy by using the correct screwdriver. Whether you need a standard slotted or Phillips, we offer a wide range of screwdrivers. 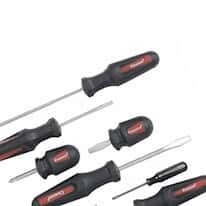 Select from standard slotted, Phillips, torx, or nutdriver styles that you can purchase individually or in sets. We also offer ratchet models that help relieve the stress on your hand and arm. Ergonomically designed handles with cushioned rubber covers make them comfortable to use. Zinc plated shafts are durable and stand up well in stringent conditions.